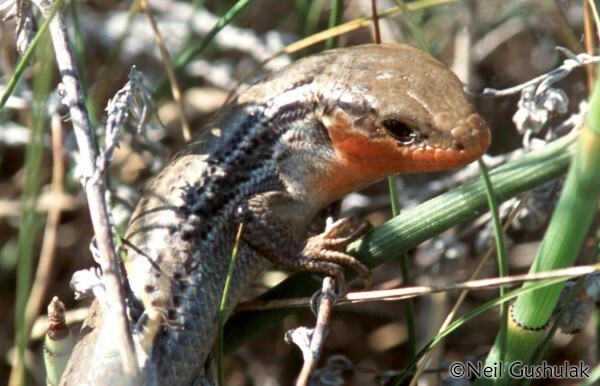 Manitoba's only lizard, the northern prairie skink (Plestiodon septentrionalis) is in trouble! Manitoba Conservation, the Prairie Skink Recovery Team and NatureNorth.com are on a mission to protect these beautiful little reptiles. This Save Our Skinks (SOS) website is about letting you know how you can help! To protect the northern prairie skink, government, private conservation agencies and skink researchers need to know more about them. 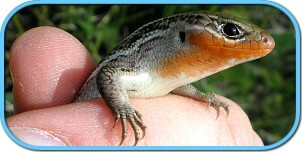 And they need to work hand-in-hand with private landowners and land managers to protect skink habitat. One-half of the lands in Manitoba thought to be habitat for skinks are privately owned. Manitobans need to work together to ensure a future for our only lizard. Throughout the SOS website you can click on thumbnail images like this one to see larger pictures. Wanted! 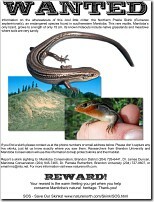 Download our skink "Wanted Poster" (PDF 300 Kb). Print it out and start spreading the word. Put it up on your home, school or office wall. Let people know you care about skinks and help others get the information they need to help skinks, too. You can make a difference! Get involved with SOS. In the Skink Monitoring section there are some examples of other Citizen Science projects underway in North America to give you a better idea of where the SOS website is headed. The SOS website was featured on CBC Manitoba's Radio Noon show on June 24, 2008. You can download an mp3 version of this broadcast: Radio Noon Broadcast. Thanks to CBC's Marilyn Maki for helping to get the word out! What is a skink, and how do they live? Why are they in trouble and why protect skinks? Where skinks are found, and why. Are your sure it's a skink? No, it's not a silly question. Here's some other critters you might come across. What information is needed, where does it go and who sees it? How to tell if you have skinks on your land / how to monitor them. How to manage your land to help skinks. Concerned about having an endangered species on your land? Worried about what happens to the information you may report? For some thoughts, and to set your mind at ease, Click Here. Check for information on this year's SkinkFest at: Spruce Woods Provincial Park Interpretive Events. Check out what happened at: Skink Fest 2010, Skink Fest 2009, Skink Fest 2008 and Skink Fest 2007. For inquiries about the SOS website email us at: Contact NatureNorth.com about SOS! The SOS website is a production of NatureNorth.com funded by Manitoba's Sustainable Development Innovations Fund. For our full credits section and some additional skink links: Click Here. NatureNorth uses the Google Adsense program to raise funds and to provide accurate visitor tracking for all our content. If you encounter innappropriate or offensive ads on this site, please let us know immediately!